A spat that erupted between veteran local actresses Pan Lingling and Hong Huifang on Monday has thrown former Mediacorp star Julie Tan's love life into the spotlight, prompting her to strike back against having her name dragged through the mud. In an interview with Lianhe Wanbao published yesterday, the 25-year-old said: "My mother was heartbroken to see her daughter painted in such a negative light. "No one deserves this kind of humiliation." Hong, 58, recently severed ties with Pan, 49, via a lengthy WhatsApp text which was sent to around 50 of their mutual friends, highlighting three "thorns" which have plagued their friendship across two decades. The breaking point came last month, when Pan allegedly commented on Hong's son, Calvert Tay, and his current relationship during a dinner with friends. Tay, 18, was rumoured to be dating Tan. According to the text, Pan recommended that Tay get vaccinated against sexually transmitted diseases as a precaution, given Tan's string of past relationships - one of which was with a foreigner. Tan, who is furthering her acting career in China after leaving Mediacorp last year, told Lianhe Wanbao that she spent the whole day in tears when news of the spat broke. "To the one talking s*** about me, you know what, f*** you. 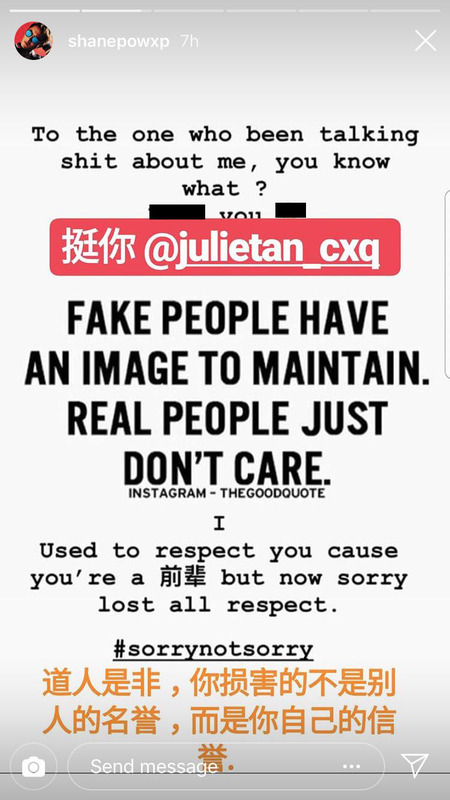 I used to respect you cause you're a 'qian bei' (Chinese for senior), but now sorry lost all respect," she fired back on social media platform Instagram. Tan has since clarified that she and Tay are friends but are not dating. She also expressed her gratitude towards Hong for sharing the truth and giving her the chance to speak out against this act of bullying. "Women are already unfairly treated by society when it comes to love - women with numerous past relationships are shamed, while men with numerous past relationships are praised," she told Lianhe Wanbao. "As a woman yourself, why would you worsen the situation for other women?" Tan admitted that she is not as lucky in love as Pan, who married her first boyfriend, former actor Huang Shinan. "I had to go through various experiences in order to better understand myself and find the right person," she said. "Still, this new generation is courageous enough to accept the consequence of their actions. "Hopefully our seniors can serve as good examples to us, by taking responsibility for their words and actions too." Pan reportedly apologised in a phone call to Tan's mother yesterday morning. In her latest comments on the spat, Hong said it is "not a war, so there is no winner or loser".